Background Story: This temple is a place where the members of an evil cult pray and make sacrifices for their scorpion god. Technical: There are lot’s of games that visualizes evil with dark colors, and therefore the player can’t really see anything from it. Our approach here was to make an evil look with bright lights. You can find this demo scene in the Dark Fantasy Kit without the post-processing effects. You can also download it from Gumroad for free and move around with an FPS controller. Medium sized FPS scene with multiple rooms and outdoor garden. Background Story: The master of this manor is a villain who makes his evil plans in the defenses of stone walls. Until the hero arrives. 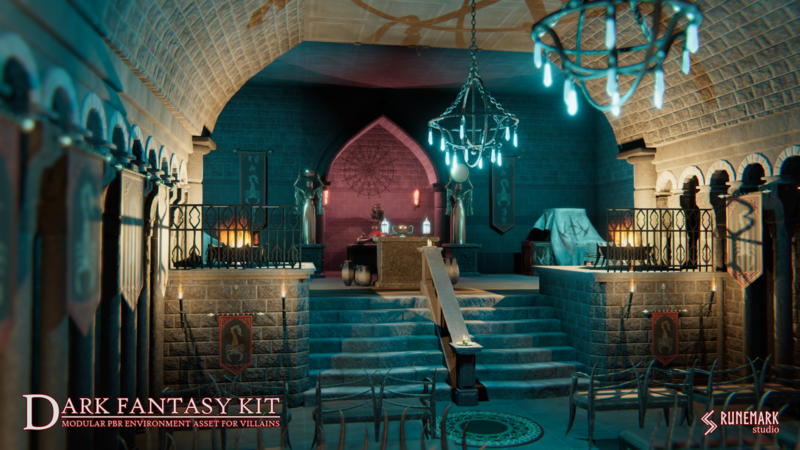 Technical: This is the first demo scene we made for the Dark Fantasy Kit. This was also a test scene where we first built something from the modular parts of the asset. Small Top-Down scene with multiple rooms. Background Story: You reach the chambers of the vampire whos minions raided your village. Technical: This scene is our first approach to use the Dark Fantasy Kit for a top-down game.